Well, "ish". I thought I'd paint him up before I posted him, It's been probarbly one of the more diffcult things I've tackled, from the point of view of being happy with the result. I've also been quite frustrated by the slow progress due to a stinking cold, well actually two stinking colds in a row. not my year it seems for those. anyway with a little help from Ron (thanks Ron) I'm kinda happy with it. for m though, the main goals were that it "reads" as a grey knihgt, and that it fits in with the rest of my army. I'd be delighted to hear any comments, have more flaws pointed out, be disagreed with, agreeed with or, well, anything really. He definitely does have that grey knight silhoutte, The pauldrons, the chestplate, the weapons and the greaves are all that grey knights shape. The only thing I might suggest, like ChicoDaSatanic put it rather less subtly :P is to maybe use thinner card on the greaves, only so that it doesn't cover so much of the foot. Overall though man, a very impressive conversion, and one I would be too inditimidated to try! I love the colors that you used, just some personal comment, I think that a bit of breaking bright color in some spots could help a lot. as it is currently is great though. some bright red could help. any way as already said, excellent work. I did realise that I needed some cloth, to paint red. I dont neccecairily think every guy needs that, but across the unit there needs to be a splash, much like with the PAGK I've already had a go at. Lovely work with the paint, I like what you did with the metallics. Love the model. 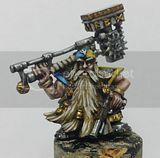 Is there any chance you could do a tutorial of how you made this guy and the others so that I can do the same to my next batch of AOBR models.